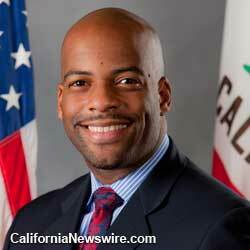 SACRAMENTO, Calif. /California Newswire/ — The California State Senate has approved a measure by Senator Isadore Hall, III (D – South Bay) that publicly condemns Republican Presidential candidate Donald Trump for his repeated racist remarks against immigrant families and calls upon the State of California to divest any business relationships with Donald Trump, the Trump Organization or any of his affiliated business entities. The resolution also encourages private businesses and individuals throughout California to end all business ties with Donald Trump, the Trump Organization or any of his affiliated business entities. The measure was approved on a 25 to 1 vote. Companies throughout the nation responded to Trump’s racist comments by ending their business relationship with him including NBC Universal, ESPN and the Professional Golf Association. CalPERS, the nation’s largest public employee pension fund has identified real estate investments in New York State valued in the millions of dollars that would be impacted by California’s divest from the Trump Organization. Joined by nine Senate co-authors, SR 39 would make California the first state in the nation to publicly call for its government to divest from Trump and encourages the state’s businesses and 38 million residents to join California’s efforts to DUMP TRUMP.